is a striking slow growing species that forms large clumps with age. It is easily distinguished by long whiskery spines that vary in colour (the 'brunispina' is the brownish coloured form). The globular body freely offsets into a mound. Origin and Habitat: Endemic to a very small area in Chile, II Region Atacama desert, Antofagasta, north of Taltal, coastal mountains, 500 - 2000 m. Typical area is San Ramon Valley. Habitat: This species strives fully exposed to the sun in extremely dry areas with very rare rainfall, on hills and canyons on plains and on slopes facing north. 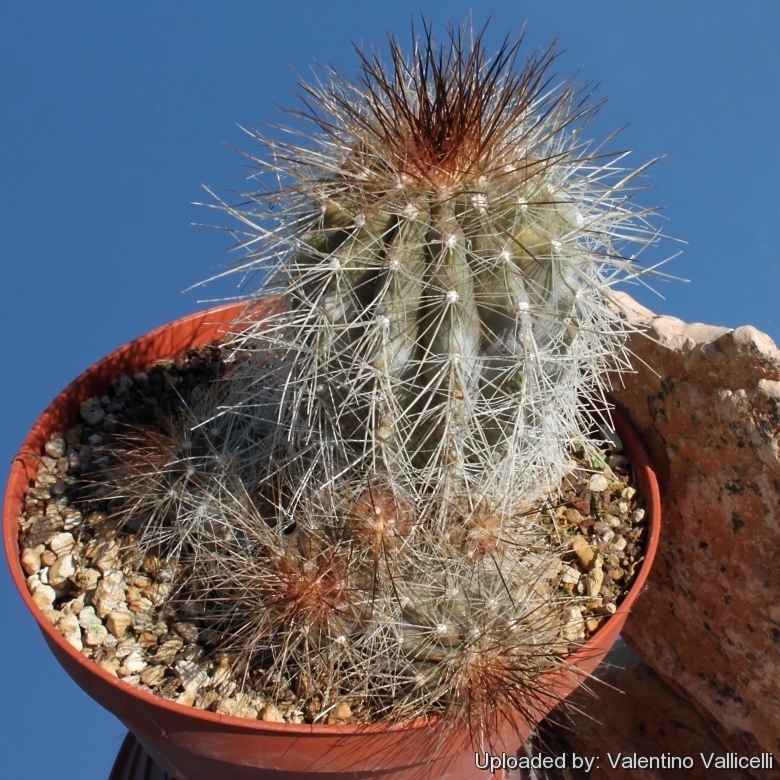 They often grows mingled with clumps of Copiapoa cinerea forma haseltoniana and columnar Eulychnia. The dry season lasts 8 - 12 months and in some years it is possible to have no rainfall at all. Rainfall less than 100 mm/year. The plants obtain water mainly from condensation of coastal fog (camanchaca). By the middle of the morning however, the fog cover dissipate and sun breaking through the gaps warming the ground. Description: Solitary or forming large clumps up to 1 m wide densely covered by spines, it one of the more beautiful and popular copiapoa, it is really the most extreme of a very variable population. 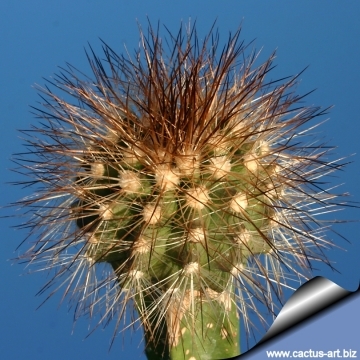 It is a member of the Copiapoa cinerea complex. Stems: Globose to cylindrical usually grey to green in hue, up to 12 cm wide with a woolly crown. Ribs: 13 to 24 ribs, straight. Areoles: Large, roundish, with grey wool. Central spines: 14 to 20 up to 2,5 cm long (or more). Radial spines: 10 to 12 greyish approx 2 cm long. Flowers: Clear yellow, 3.5 cm long. Fruits: White or rose, up to 1 cm long. Remarks: Pretty, white-spined forms need to be large before flowering; darker-spined plants grow faster. Copiapoa krainziana F.Ritter: has thin, needle-like, white or greyish spines (14-20 central spines and 10-12 radials). Taltal, Antofagasta, Chile. Copiapoa krainziana var. 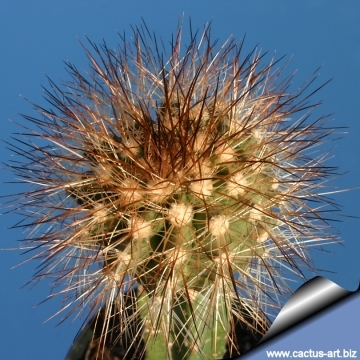 brunispina: forms large clumps up to 1 m wide densely covered by very thin, needle-like brownish spines. Taltal, Antofagasta, Chile. Copiapoa krainziana var. 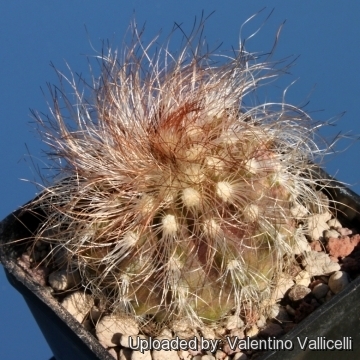 scopulina F.Ritter: has only 10-20 thin spines. Distribution: North of Taltal, Antofagasta, Chile. 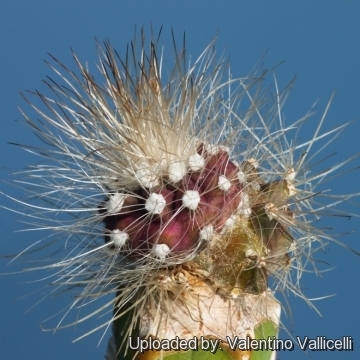 Notes: Some authors consider that Ritter's Copiapoa krainziana v. brunispina is part of a variable hybrid swarm between Copiapoa cinerea and Copiapoa krainziana. 1) Saldivia, P., Guerrero, P., Faundez, L. & Walter, H.E. 2013. Copiapoa krainziana. In: IUCN 2013. IUCN Red List of Threatened Species. Version 2013.2. <www.iucnredlist.org>. Downloaded on 16 February 2014. 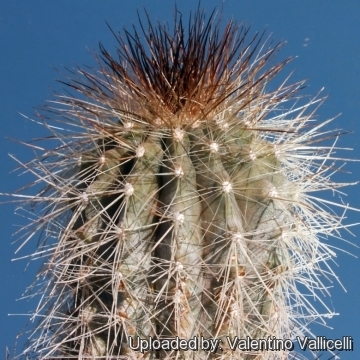 Cultivation and Propagation: This slow growing cactus is kept for the beauty of its form and spines. It must be protected from excessive heat and sun in summer, and seems to do best in cultivation with a bit of shade. It requires light but regular waterings in summer, but let the soil mix dry between waterings, Prone to rot if over-watered. Needs good drainage. Keep warm and dry in winter (10°C) to avoid rot. Not highly tolerant of a great deal of frost. (Frost tolerance 0°C)Propagation: Seeds (or offsets if available), Grafting is often used to speed growth rate and to create a back-up to plants in collection.